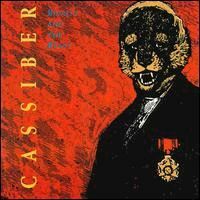 Cassiber's debut album was originally intended to be a one-off, but shortly after its release they were invited to play at the Frankfurt Jazz Festival and further live work followed. A couple of years after Man or Monkey they recorded Beauty and the Beast, which was created using the same methodology as before - improvised composition - but their experience as a performing band had made a difference to their music; on this occasion there was a greater sense of coherence both within the individual pieces and across the album as a whole. As on their previous outing the album featured a mixture of instrumental and vocal tracks, although on this occasion Chris Cutler's texts were not used as extensively as before. The use of electronics was also more prominent this time around, with cassette recorded voices woven into the fabric of several tracks. Robert, the second track, features a brief snippet of Captain Beefheart reciting The Dust Blows Forward, while elsewhere the vocals seem to have been recorded from German news broadcasts, and for the most part this technique is very effective; on later albums Cassiber would use samplers and electronics even more prominently. Two cover versions are included: Und Ich Werde Nicht Mehr Sehen is a Hans Eisler piece, while At Last I Am Free is a song by Chic that was also covered by Robert Wyatt on Nothing Can Stop Us. At Last I Am Free is one of the album's highlights and manages to be faithful to the spirit of the original but also has the same uncompromising RIO sound as the rest of the album. The more 'free' improvisations veer into some decidedly abstract territory, but the album is sequenced so that they are contrasted with more accessible pieces and many of the tracks segue into each other, creating a constantly shifting mood. There are also moments of real beauty, particularly from Goebell's piano and Harth's saxophone, although any lyrical passages are brief and there is usually something loud, discordant or disturbing to provide contrast. Beauty & the Beast is an uncompromising piece of work, but it has stood the test of time rather better than Man or Monkey. It's interesting to compare it with Skeleton Crew's debut album, which was released at around the same time and which also made extensive use of taped vocals. Both are very much products of their time, RIO meeting post punk experimentalism, and both see former members of Henry Cow engaging with new developments in music and remaining progressive in the truest sense of the word. If you like one, you'll probably like the other; Beauty & the Beast can be recommended to anybody who likes 80s avant rock and indeed to anybody inclined to try something adventurous for a change.